Summit County’s LetsGoSummit flyers and website are gorgeous. Soothing green and blue fonts explain how the new Jeremy Ranch and Pinebrook roundabouts will “improve mobility and safety and protect the environment while enhancing the economic vitality of Summit County.” There’s even a cute graphic at the top with a bus, a traffic signal, and a bicycle. So it’s unfortunate that Summit County has decided to throw pedestrians and cyclists under the proverbial bus. For years, Summit County has been working on getting people out of their cars and onto buses and bikes. The county spent millions on a park-and-ride by Ecker Hill and hundreds of thousands more on connecting it to the rest of the bus network. They launched an electric bike-share program in 2017 with the hope that residents will use rented bikes instead of their cars. E-bikes have the potential to make those shorter commutes easy and fun. As prices drop and bikes continue to improve, the potential exists to get a LOT of people out of their cars. Riding an E-bike is an incredible experience. For a town with as many problems with traffic congestion as Park City, a fun and short commute via an E-bike is a dream come true. That’s if they can ride safely, of course. For most people, that means minimal riding on surface streets with speed limits over 25mph. Once you’re out of your immediate neighborhood, you need to be away from the cars. Luckily we have a fantastic network of bike paths that we can use to get almost anywhere. So when we examined the plans for the new roundabouts, we were shocked to see that instead of off-grade crossings to allow residents of Pinebrook and Jeremy Ranch to access the Rasmussen and Kilby paths, the county plans merely to install crosswalks. CROSSWALKS. If you’re riding, walking, or otherwise commuting without a car, you’ll have to cross the roundabout at least once and often twice to access the trail – unless you want to roll the dice and ride in the road with the cars. Even worse, kids walking, skateboarding, or biking to JRES or Ecker will have to negotiate the roundabouts on their way to school – during the busiest times of day. How bad can that be? You might ask. Well, pretty bad, really. Most of you are familiar with the roundabouts in Kimball Junction. Some of you may have even tried to cross them at busy times and struggled to get drivers to stop, or had to sprint or dart back to avoid being run over. If you’re like many of us, you’ve come close to hitting pedestrians even when you’re alert and paying attention. The problem for pedestrians when entering a roundabout is that drivers entering often only to look to their left to see if they can merge. Drivers exiting have a clear shot and often don’t look left or right at all. Of course, a pedestrian has to cross both lanes (entering and exiting traffic) and contend with 2 sets of drivers who aren’t looking where they’re trying to cross from. For cars, roundabouts are great. Traffic can flow faster, more safely, and we’ll hopefully reduce congestion during rush hour (anyone who has tried to turn left from the I80 exit ramps knows how bad it can get). There’s no question we need major improvements for vehicles. However, building them without off-grade crossings (tunnels) will hamstring the bike/pedestrian path system – who cares how many miles of path there is, if we have to risk our lives to access it? Who on earth is going to send their kid off to school on their bike knowing our little ones will have to cross the roundabouts during the morning rush? There are 2 interesting things about this response: Most people wouldn’t send their kids to cross the Walmart roundabout for a million bucks. It’s terrifying! Does the county really think that is an example of a safe intersection for pedestrians and bikes, let alone one that will encourage biking and walking? Second, clearly cost is the main factor here, since the “physical constraints” can apparently be overcome in the event of problems. We followed up again by asking if the county anticipates that the pedestrian situation at the new roundabouts will be similar to that of the Walmart roundabout, but did not receive a response. Let’s be clear – the roundabouts are needed. If the county is sincere in wanting more residents to commute without getting in their cars, though, they are failing miserably here. If you build something that terrifies parents and bike riders, they will just drive to their destination and never attempt to cross the crosswalks. Traffic engineers will look at the traffic and say “well, there’s no problem – no near misses, no accidents, pedestrian safety is great.” But that will only be because no pedestrians are willing to risk the crossing. And the county will wonder why they can’t get people out of their cars. The e-bike share program won’t help if we don’t have the physical infrastructure in place for people to safely ride anywhere. The county is being pennywise and pound foolish by building the roundabouts this way, and it’s a damn shame. Want to do something about it? Please don’t treat it like Kilby Road and wait until its done. Once the roundabouts are built, the County Council will be making victory laps around it. Your complaints won’t do much at that point — just like on Kilby Rd. If you ride your bike from Summit Park, Pinebrook, or Jeremy into Kimball Junction (or beyond), the roundabouts (as planned) will introduce danger into your routine. If you have children that go to Jeremy Ranch Elementary School, the danger is almost unfathomable. Or more succinctly put, kids won’t ride their bikes or walk to school for fear of trying to cross the six-way roundabout. If you don’t care, please don’t complain about traffic in the future. These are the little (and important) steps that our community needs to take to address traffic. A million buses won’t solve our traffic issues. However, if we can design our pathways to be bike and human-friendly we have a chance to make things better. 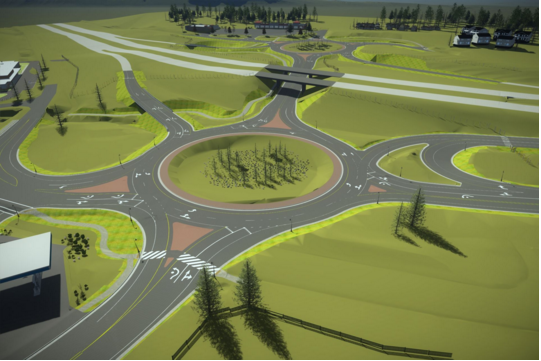 The upcoming Jeremy and Pinebrook roundabouts are anything but human-friendly. Let’s hope we can come up with a better solution than crosswalks. If not, we will end up with a worse solution for pedestrians and bikers than we have now. Thank you for writing this. I couldn’t agree more. It’s all or nothing. Just having safe passage across the interchange is not enough. There HAS to be a seamless circuit for the pedestrians to be able to navigate that monster of an interchange. Meaning, we need tunnels across Pinebrook and Homestead Roads. You are completely right. The parents WILL NOT ALLOW their kids to walk, ride or skateboard to school….ever. Until there is safe passage all the way through. I will be writing to the county council. I will do everything and anything to stop this nightmare before it’s completed. Another thing PC people can do is to check out “Park City Pedestrian Passage” on facebook. https://www.facebook.com/ParkCityPedestrianPassage/ Please, if you simply click ‘like’ on the page you are telling Summit County how much safe pedestrian passage means to you. Join the other 581 people that value alternative modes of transportation. Thank you! ALL the roundabouts at Kimball Junction have crosswalks. Maybe you can look into reports of problems there. Pedestrians have right of way, always. Any confusion as to how to use a roundabout can be cleared up right here. The crosswalks are a fair distance from the schools but you could lobby to have crossing guards present at the beginning and end of the school day. Or create a survey to determine how many student actually cross under the bridge daily at present, crossing the I-80 on-ramps and off-ramps, which currently have no crosswalks at all. 1) Many children in Salt Lake City walk and bike to school with the assistance of crossing guards. Could the County consider crossing guards during school commute times so that parents can feel safe sending their children to school? 2) Could the County also install significant blinking signs to warn drivers when there are people walking or biking in the crosswalk? I assume the crosswalks would be set back from the roundabout enough to allow for large blinking signs to go off right before the roundabout exit when someone pushes a button to indicate they will be in the crosswalk. Perhaps other cities/countries have additional options that slow drivers down that I don’t know about, too. 3) Could the Summit County Sheriff increase its patrolling of local walkways so that there are actual consequences for not yielding to people walking in crosswalks? I really want this project to be a success and help the Council fulfill its stated goals of decreasing congestion and improving the environment. More people on foot and on bikes would be a great outcome if this is done right. Pinebrookian, Those are much better, simpler, cheaper, less permanent options than tunnels. I doubt the County will actually listen and adjust their plans based on actual user experiences. I’d like to know if this plan has been independently reviewed by another engineering firm so we don’t get another Kilby Road disaster. The only hope of getting people out of cars is to provide safe alternative means of transit. Its obvious by the ever growing number of roundabouts in the basin that transportation remains heavily focused on traditional vehicular traffic. Isn’t throwing a pedestrian into a roundabout the antithesis of roundabout design, which is to keep the flow of traffic moving with minimal interruption? Has anyone else not been shocked by the sudden appearance of a pedestrian in the middle of a roundabout and almost being rear ended when they stop? How about pedestrian crossings at night? Is there anyway that could be safe? Entering the crosswalk of a roundabout without making direct eye contact with drivers is an invitation to disaster. As to crossing guards, I will leave it up to someone much more creative than me to design a meme depicting how many guards it would take to attempt to provide safe passage across roundabouts at freeway interchanges during peak travel times. It would be front page worthy. Remember the pedestrian overpass to no where? Seems that not much has changed when it comes to the county’s transportation solutions. And they want a bigger role in public transit?? ?